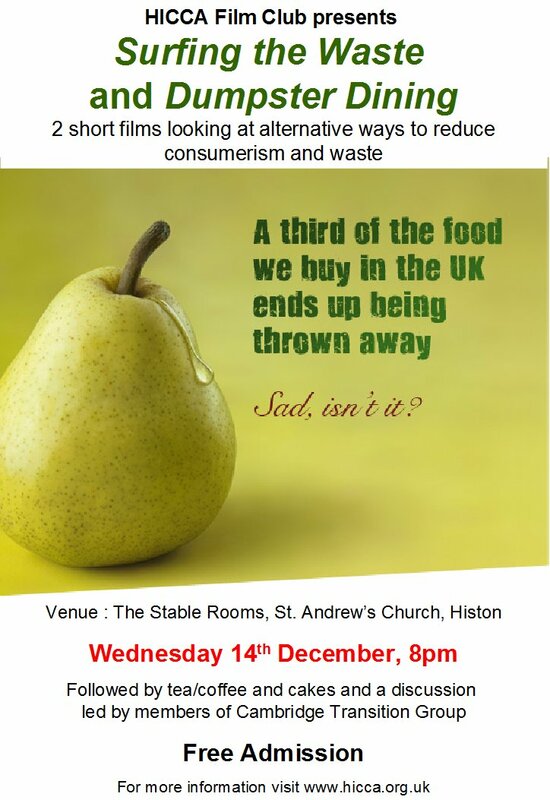 This month’s HICCA Film Club meeting will take a look at some radically alternative ways of dealing with the worst excesses of human consumption. Freeganism might not be to everyone’s taste ( pun intended!) but protagonists look upon this as a lifestyle choice that, if nothing else, helps them highlight the amount of ‘stuff’ – whether it’s food or material goods – that is not only created, but is just thrown away when it could still be put to good use. We’ve got two short films to present, followed by a discussion led by two members of the Cambridge Transition Group – come and join us for what’s sure to be an interesting session !